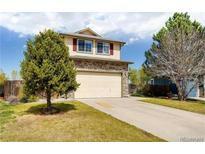 Below you can view all the homes for sale in the East Quincy Highlands subdivision located in Aurora Colorado. Listings in East Quincy Highlands are updated daily from data we receive from the Denver multiple listing service. To learn more about any of these homes or to receive custom notifications when a new property is listed for sale in East Quincy Highlands, give us a call at 720-580-6694. Your choice! This one won't last! MLS#7602716. Realty One Group Premier. HURRY this one is a gem and will go fast! ! MLS#9457759. HomeSmart Cherry Creek Properties. One of the nicest in the area. Laundry room on top floor. MLS#5434682. Your Castle Realty LLC. You will love the deck on the back of the house for summer BBQ's. MLS#3238350. Proform, Inc.
Close to shopping at Southlands, E-470, and Arapahoe County Fairgrounds, and Aurora Reservoir. MLS#8622405. THE EDGE GROUP LLC. New Solar Panels installed in 2019 with SunRun. Open House 12-3pm April 20th! MLS#6094263. EXIT Realty Cherry Creek. Minutes away from Southlands Mall shopping and dining, I-225, E-470, Aurora Reservoir, parks, hiking, and biking! Welcome home! MLS#2332683. Keller Williams DTC. The contract is assumable with payments of $167.65 month for approx 19 years. MLS#8318133. HomeSmart Cherry Creek. Walk around the block to your neighborhood park. MLS#8402318. Brokers Guild Classic. Formal living room; updated kitchen w/ granite & stainless steel appliances, dining area w/ slider opens to stamped concrete patio; open floor plan; great room with gas fireplace; spacious master suite, 2nd floor laundry; finished basement w/ family room, 5th bedroom or den w/ egress windows, work room and rough-in for additional bath; large fenced yard, 2 car attached garage, ample storage. MLS#2956700. Your Castle Real Estate Inc. Enjoy beautiful summer days on the back patio while grilling and playing yard games. MLS#8851322. Berkshire Hathaway HomeServices Innovative RE. Centrally located and close to all the amenities & easy access to E470. MLS#7236206. Redfin Corporation. Tenants are nice and also helpful. MLS#9318802. HUTTON HOMES REAL ESTATE.